Death is the picture of the Grim Reaper at sunrise. Ruled by Pluto, he teaches us to purify and transmute our energy, to “die daily” to an old way of being, to embrace a higher energy and create a new life. 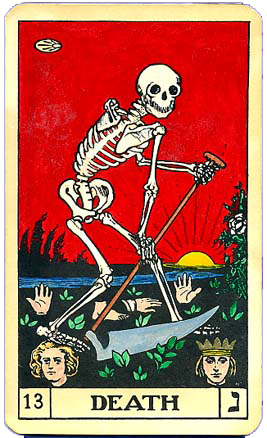 The sign of Scorpio and the Death card are initiates of the Mysteries, they understand transformative power and remind us that to live is to die and to die is to be reborn. Change is the basis of manifestation and it begins with intention. Confer with Death when there is resistance to change. Death image on journals, T-shirts, and mugs. Affirm: I Am One with the One.